Eating more vegetables is perhaps the simplest and most effective way to enjoy a healthier diet. It's also an ideal food group to focus on when you want to add variety to your meals. Ever notice that the produce section is the biggest in the market? Among those bounteous displays of veggies are countless combinations of colors, flavors and textures, and some of the most appealing among them belong solidly in the crunchy category. Crunchy vegetables are great for snacking, dipping, giving substance to salads and adorning crudité and cheese plates. Some also hold their crunch when cooked. You'll generally find sliced bamboo shoots in cans in the supermarket, although specialist Asian markets might stock fresh or frozen bamboo shoots. They're great for adding crunch to a stir-fry, with a mild flavor that works with all kinds of sauces and seasonings. Beautiful beets in their inky red, golden and pink ombre hues are most often served roasted until they're soft, but the sweet, earthy roots are perfectly edible raw, which means they keep their crunch. In this summery salad, beets are sliced paper-thin and served in a vinegary dressing alongside cool cucumbers, creamy ricotta, lots of fresh herbs and a touch of fresh, hot chiles. Bell peppers, whether full-size or "baby" size, add lots of color and crunch to a salad or crudité platter. 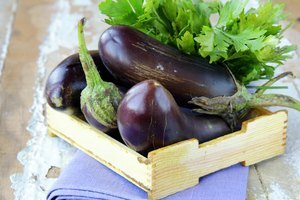 Each of the colors of peppers – red, yellow, orange, green or less-common purple – has a distinctive flavor and level of sweetness. For maximum crunch, enjoy them raw, but when stir-fried or grilled very briefly, they should retain some bite. 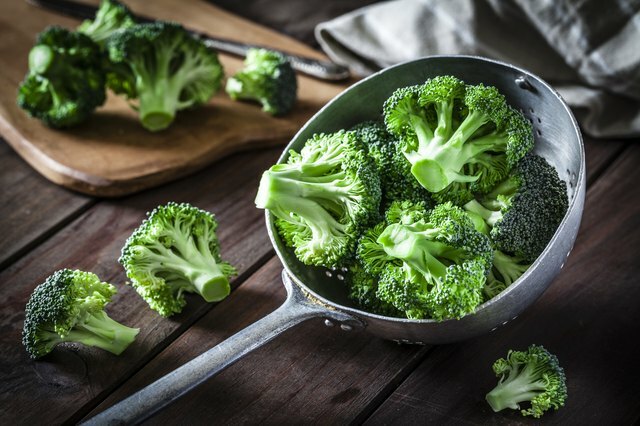 Broccoli and Broccolini (a cross between regular broccoli and Chinese kale) are among the more popular vegetables, but many people dislike them when they're raw. Broccoli thrives when roasted, blanched or steamed to a point between raw and fully cooked, with some crunch left in its stems. In this salad, the broccoli is left raw, sliced thinly on a mandoline and tossed with toasted hazelnuts and tomatoes. It settles into a mustardy dressing, which mellows out the rawness. Similar to their cruciferous cousins, broccoli and cauliflower, Brussels sprouts are crunchiest, but strongly flavored, when raw. 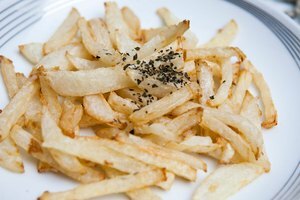 Lightly cooked or shaved thin, they keep some crunch, but meld better with other ingredients. Also consider this technique, with a hot, hot oven and plenty of olive oil, to roast Brussels sprouts with a perfectly crisp exterior and toothsome middle. Red, green and napa cabbages and bok choy lend their signature crunch and mild, peppery bite to salads, slaws, quick sautes and stir-fries. Add a handful, dressed with citrus zest, to fish tacos or veggie burgers. Roast wedges of cabbage, brushed with olive oil, in a very hot oven for a crunchy interior with charred, wilted outer edges. 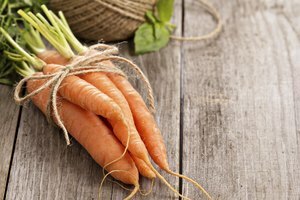 The most familiar of all crunchy root vegetables is probably the carrot, available in sizes from pinkie-finger to forearm, ready-to-snack "baby" carrots, organic bunches with their green, feathery fronds, and purple, yellow and white varieties. Snack on them straight from the fridge, dip batons in hummus or grate them into a classic coleslaw. Consider more exotic types of carrot salads, perhaps diced small and infused with Moroccan flavors, courtesy of cumin, lemon and garlic, or grated into an Asian slaw with peanuts and a ginger dressing. It's more than a bloody mary twizzle stick. Use crunchy sticks of celery for dips, to add crunch to chicken and tuna salads, or prepare ants on a log. Fennel, a white bulb the size of a softball, has a distinct aniseed flavor that's usually best in smaller doses. In this decadent lobster and fennel salad, paper-thin slices of fennel are soaked in ice water with lemon for maximum crispness. Jicama, popular in Mexico, is the tuberous root of a plant in the legume family, with a mild flavor and major crunch. There are lots of ways to eat jicama, including a refreshing Mexican fruit salad with mango, pineapple, cucumbers and watermelon, all sprinkled with lime juice and chili powder. Pick up a greenish-white, globelike kohlrabi at the market and experiment with this crunchy vegetable. It's a little spicy when raw and sweeter when cooked. To prepare kohlrabi before eating it raw, peel off the outer layer; then slice it thinly or grate it. The crunchiest lettuces – iceberg, romaine and bitter red radicchio, a variety of chicory – are most at home in salads, but have plenty of other applications too. Use them in the place of buns or tortillas as lettuce wraps or as edible cups to hold servings of dips and other appetizers. Snap peas and snow peas are crisp and sweet whether raw or quickly stir-fried, as are most green beans. Consider various types of green beans, such as slender haricots verts, yellow wax beans and vibrant purple beans, which only hold their color when raw. Blanch them to star in a classic salade nicoise. Peppery, crunchy radishes, a member of the cabbage family, are commonly eaten raw. 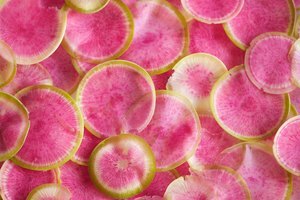 Snack on pink radishes with butter and salt, dice or slice them into a salad, or make quick-pickled radishes to top a taco. Water chestnuts, technically not a root but a corm, are super-crisp even when cooked. You'll often find them in a stir-fry, but they're also the crunchy component in a spinach and artichoke dip. Try this lighter spinach dip with yogurt and cottage cheese in place of some of the oilier ingredients.